In preparation for Spaceworks’ 2nd annual fundraiser NEON, artist Galen Turner installed a flashy, tongue-in-cheek Artscape in one of the Woolworth Windows. He used traditional, mechanical relays to make the neon lights glow in various patterns. You can observe the relay gears animating the signs by opening and closing electrical circuits creating a dazzling, flickering artwork. The neon signs are much more impressive in person. Visit this Artscape while you can in downtown Tacoma, on Broadway and 11th street. Check out Galen’s installation process below in photos taken by Kris Crews. Are you a professional artist that lives in Tacoma and/or has a working studio in Tacoma? Do you want to open your studio to the public, demonstrate how you make your work, host a hands-on activity, and help raise the visibility of the arts in Tacoma? Apply to participate in our 16th annual Tacoma Studio Tour! Visitors to Liz Pulos’ studio try a weaving project. The Tacoma Arts Commission is seeking professional artists who are willing to open their studios to the public for the Tacoma Studio Tour, one of the features of Tacoma Arts Month this October. The emphasis of this tour is on raising visibility of the arts and providing artistic opportunities for the community to connect to the arts. We encourage artists to have work for sale. Studios will be open on Saturday, October 14th and Sunday, October 15th from 11 am to 5 pm. Artists can choose to be open on Saturday, Sunday, or both days. The Tacoma Arts Commission will produce extensive electronic publicity materials including email newsletters, blog posts, and an interactive website and map. We will also produce a printed brochure for the Tacoma Studio Tour. The studio tours are free to both the artists and visitors. Due to very positive feedback from both visitors and artists alike, we will be bringing back the Studio Tour Passport this year. The purpose of the Passport is to encourage people to attend multiple studios and studios they’ve never been to before by incentivizing attendance. Studio Tour artists are encouraged, but not required, to donate a small art item that can be included in the prize packages. 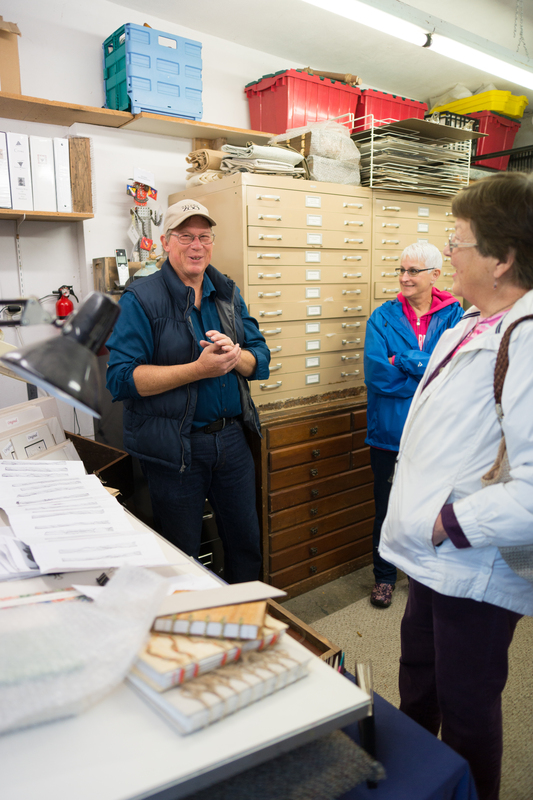 Mark Hoppmann talks with visitors at his book arts and illustration studio. Deadline for applications is Monday, June 26, 2017, 11:59 pm. Applicants will be juried in a competitive process by a sub-committee of the Tacoma Arts Commission and selected based on the quality of artwork and the overall diversity of the work presented, as well as geographic diversity of the studios. 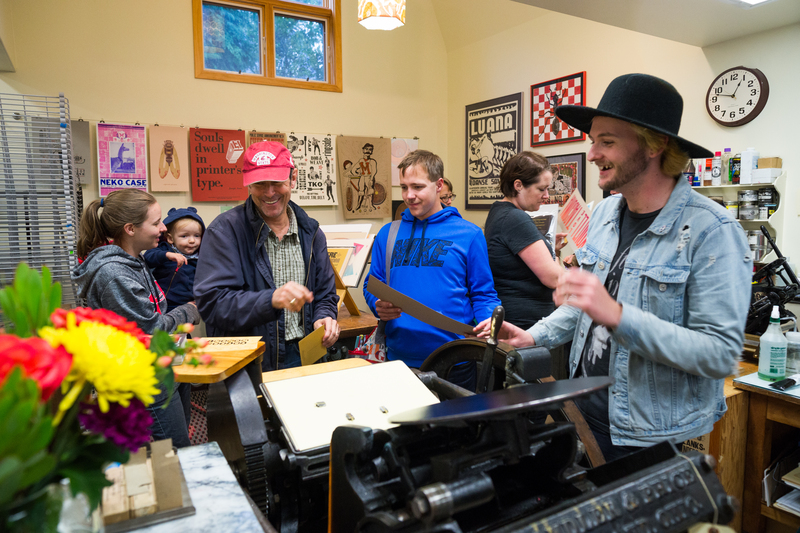 Visitors to Jessica Spring’s studio make a keepsake on a vintage press. Please note: each artist in a group studio needs to submit their own application, work samples, and resume.